Spoiler Alert: You&apos;re going to love your One Tree Hill tour of Wilmington. Fans of the popular WB drama flock to the area to tour our riverside sites and recreate the show&apos;s most epic scenes. See the locations where Chad Michael Murray, Sophia Bush, James Lafferty and Hilarie Burton began their television careers. Between 2003 and 2012, 288 episodes over nine seasons were filmed in the Wilmington area. This is the story of two half-brother&apos;s life of conflict and affinity and their rivalry on and off the basketball court. 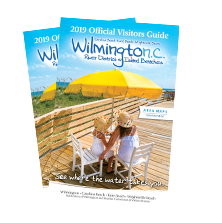 Visitors love taking self-guided tours of businesses and attractions in Wilmington&apos;s Historic River District. We&apos;ve put together a map and list of landmarks that are must-see locations for One Tree Hill fans. Get ready for your stroll through "Tree Hill" North Carolina. Start off at Riverfront Park, which is located on the Wilmington Riverwalk across from the Alton Lennon Federal Courthouse. It is recognizable as the backdrop for some outdoor basketball games during the show. "Don&apos;t say I never gave you anything." Grab a box of Cracker Jack&apos;s to recreate the famous scene along the Riverwalk. At the base of Market Street along Water Street you&apos;ll find the famous "Naley Bench" where Nathan gave Haley the Cracker Jack bracelet. You&apos;ll see more familiar sites as you stroll the Wilmington Riverwalk overlooking the Cape Fear River, including the location where the annual "Burning Boat Festival" took place. The outdoor patio of the restaurant at 5 South Water Street served as an open-air produce market in several episodes. You&apos;ll recognize the Black Cat Shoppe at 8 Market Street as the CD store where Chris (Tyler Hilton) worked, although it&apos;s no longer a CD store. In that same block, Edge of Urge at 18 Market Street was the setting of a lingerie shop in the show. "What&apos;s your take on tattoos?" Blue Post Billiards at 15 South Water Street appeared many times throughout the show. This nightlife hot-spot is where Lucas and Brooke went on their tattoo date. If visiting this location, know that you must be 21 or over to enter. Head south on Front Street to Reel Café,100 South Front Street. This is the location of "Carl&apos;s Crab Shack," where Brooke got a PR job. The restaurant Platypus & Gnome at 9 South Front Street doubled as a restaurant during season five of the show. The Dixie Grill at 116 Market Street served as the location of Sam&apos;s favorite diner, where Brooke&apos;s foster child hung out during several episodes. Graystone Inn at 100 South Third Street doubled as a funeral home and as a New York apartment and hotel room during season five. The school at St. James Episcopal Church at 25 S. 3rd Street doubled as Jamie&apos;s preschool on the show. The historic New Hanover County Courthouse, 24 North Third Street, is where the show&apos;s cast hung out during season one&apos;s filming of Keith and Lucas&apos; car crash scenes at the corner Third and Princess. Courthouse interiors were used during an election rally. At the corner of Third and Chestnut streets are the front steps and Corinthian columns of Thalian Hall, which frequently doubled as the steps of town hall. Hell&apos;s Kitchen at 118 Princess Street is the location of the show&apos;s "Swinging Donkey Bar." New Hanover County Public Library at 201 Chestnut Street posed as a health clinic in the show. The building at 300 North Front Street stood in as "Karen&apos;s Cafe" in the pilot episode and also "Tree Hill Cafe" in the show’s final season. Once the series was picked up, crews built a designated set for "Karen&apos;s Cafe" on the opposite corner of Grace Street at North Front Street. During season six, the set for "Karen&apos;s Cafe" was removed and the space was transformed into the "Clothes over Bros." set, then later revived as "Karen’s Cafe". The spot now houses Outdoor Equipped and Redix stores. Grace United Methodist Church at 401 Grace Street is the location of Brooke and Julian&apos;s wedding and where both Lucas and Lindsey and Keith and Jules were supposed to get married, but didn&apos;t.
The Cape Fear Community College campus at 411 North Front Street served as locations, including Whitey Durham&apos;s Field House, in several episodes. Specifically, you may recognize the Health Sciences building, library and courtyard. The front entrance of the Joe and Barbara Schwartz Center at 610 North Front Street appeared as the exterior of the show&apos;s high school. Walk around to the back of the building, which was used for the gym&apos;s exterior scenes. The Wilmington Convention Center at 10 Convention Center Drive was the venue for Brooke & Julian’s wedding reception in season eight. Just across the Cape Fear River from downtown, there&apos;s Battleship Park on Eagle&apos;s Island. The site next to the Battleship North Carolina served as the location for the River Court outdoor basketball court. The River Court was dismantled after the series ended, but taking in the views of Wilmington from this side of the river should be familiar to fans of the show. Greenfield Lake Park at North Lakeshore Drive was the setting for Lucas&apos; and Peyton&apos;s beautiful outdoor wedding in season six. EUE/Screen Gems Studios is the studio and home-base for the show. The studio is located at 1223 North 23rd Street. They re-named a short street that runs beside the studio “One Tree Hill Way” and is a great photo opp for fans. A dream sequence from One Tree Hill was shot at Airlie Gardens. In this dream, Karen envisions a fantasy scenario with her lost love Keith, along with their young daughter Lily, who is frolicking amongst the azaleas. Parts of the show were filmed at Jungle Rapids Family Fun Park at 5320 Oleander Drive. Fans will remember scenes from the arcade, miniature golf course and Big Splash Café and Pizzeria. Several scenes in the show were shot at The Stadium Batting Cages at 5570 Oleander Drive. Performance Import Cars at 19 Covil Avenue is the site of the Scott Body Shop where Nathan and his uncle worked. Stevenson Honda Acura at 821 South College Road was the prototype used for the studio reproduction of Dan Scott&apos;s car dealership showroom at Screen Gems Studios. Johnnie Mercer Fishing Pier at Wrightsville Beach was used as a location on the show. Nathan and Haley were married by the rocks at Fort Fisher State Recreation Area, which is located just south of Kure Beach.